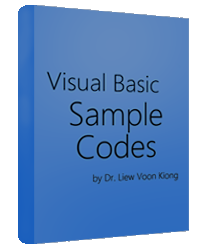 This is a simple digital slot created by us using Visual Basic. 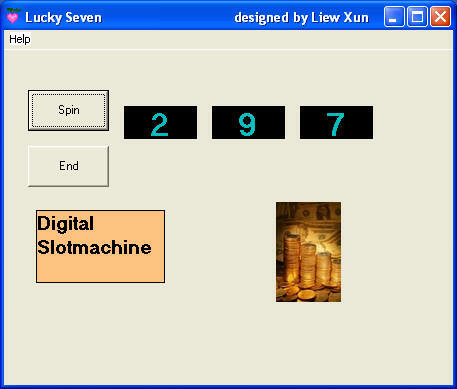 In this program, you need to insert three labels for displaying the digits, one label to display the "Slot Machine " name, two command buttons which is used for spinning and ending the program. Lastly, add one image and make it invisible at runtime. In the program, RND function is used to generate numbers from 1 to 9 using the formula Int(Rnd * 10) so that the numbers appear randomly on the three labels. Whenever any one digit 7 appear, the image will be made visible. Besides that, you may want to make the program plays a sound using MMControl. MMControl1.FileName = "D:\Liew Folder\VB program\audio\applause.wav"